The entire community was shocked at the sudden death of Norm Lisherness, city police chief on Sunday afternoon, following a massive coronary heart attack. He had driven a fire truck to a fire east of town, and on coming back to the fire hall had Patrolman Heitman accompany him home, as he said he felt ill. He called Bill Silves and he and Mrs. Silves drove to the Lisherness home at Fourth and Warner. A daughter, Maureen, came to the house at the same time. Mr. and Mrs. Silves drove Lisherness to the office of Dr. Richard Gross. Mrs. Lisherness, who had come home, went to the doctor's office and accompanied her husband to the United General Hospital in an ambulance which was called. He died shortly after entering the hospital. Vigil funeral services will be held at the Immaculate Heart of Mary Church this Thursday morning at 10 a.m. with Father Edward Boyle officiating. For those wishing to pay their respects the body will lie in state at the Lemley Chapel until Thursday morning at 9 a.m. Interment will be in Sedro-Woolley Union Cemetery. Norman E. Lisherness was born June 11, 1922 at Lyman. He had lived in Sedro-Woolley for thirty-nine years. The Loggerodeo parade went on that year, under the cloud of Norm's death. 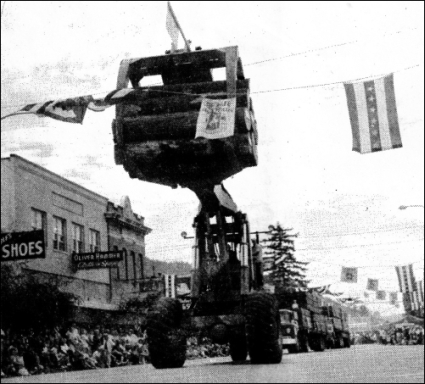 Caption: "Willis, rogers & Pearson led the industrial division of the parade with their giant loader. The mill won first place in the industrial division." He was married to Jeanne Fahey in Sedro-Woolley on Oct. 14, 1945. He is survived by his wife and by three sons, Tom, Patrick and Joe; four daughters, Maureen, Norma, Cecilia and Catherine; by his father, Al Lisherness and two brothers, Albert Jr. of Sedro-Woolley and Robert of Los Gatos, California. Norm Lisherness was a graduate of the Sedro-Woolley High School. He was one of the finest athletes which the school has produced, starring in football, basketball and baseball. He was president of the high school student boy. Al Lisherness Sr. and Earl Porter were on a boat trip to Alaska when Norm suffered his fatal attack. Al Jr. flew to Pender Island and brought them home. Norm's brother Bob arrived from California the next day. Casket bearers at the funeral will be Bill Silves, Danny McLennan, Stu Reynolds, Art Bagley, Jack Ward and Bill Pearson. Honorary bearers will be John Rowland, Paul Wilcox, Guy Rowland, Harvey Nichols, Bruce Johnson, Howard Claybrook, Mel Benson, Russ Peterson, Walley [Wally] Tresner, Jack Wardell and Floyd Cratsenberg. Members of the local, county and state law enforcement agencies will be acting as honor guard. By Mayor William O. Pearson, City of Sedro-Woolley The unfortunate passing of our Chief of Police Norman Lisherness will long be remembered by all the people of our City, as well as all the law enforcement people who have worked with him. Our entire community has suffered a great loss in the passing of this dedicated law enforcement officer. Norm performed his duties way beyond the call of duty. His community spirit was a guiding light for all of us. He was not only a devoted family man but devoted also to his city and all its people. He had the ability to lead his department in a manner that was outstanding to all our police departments in the State. He was respected for his diligent performance of police work by everyone. 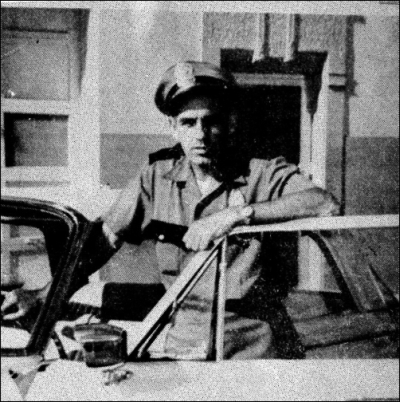 Norm was originally a logger in our community and became a member of the Sedro-Woolley Police Department Sept. 1, 1950, and served as a patrolman until his appointment to Chief of Police May 1, 1955, and he served in that capacity until his unfortunate death on Sunday, July 2, 1967. He also served on the Sedro-Woolley Fire Department for 17 years. He recently completed his second course in fire investigation of arson. His fire chief stated that he was one of the outstanding members of our fire department. He was on duty as a fireman and police officer at the time of his death. No one realized of course at the time the seriousness of his condition and Norm being the man that he was, complained to no one as was his way of life. His own feelings were always second to his obligation of duty. To the best of my knowledge Norm had very little if any insurance and we have set up two places where memorials may be offered, either at the Lemley Mortuary or the Police Department, City hall. I believe because Norm served his community so well that we should open up our hearts to help his family in this crisis and their great loss. I feel privileged to have had the opportunity to work with Norm for the past five years and I feel that I can speak for the former mayor, Puss Stendal, and Mayor Kriskov, our entire police department and fire department, our city council, our city clerk, our city treasurer, our city attorney, our city police judge, city supervisor and all city employees in saying that we cannot ever replace a man such as he in our community. Caption: "Loggerodeo Queen Frizzel and the princesses at the Log Show on Saturday. 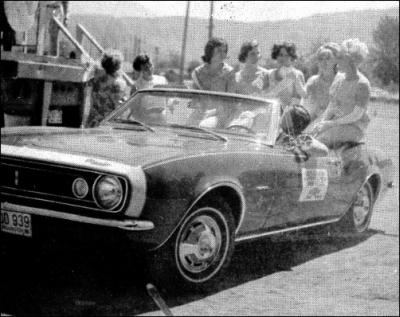 From left to right in the car are: Diane Allison, Jeanette Thresher, Queen Joline, Susan Scott and Pola Kelley." I had the privilege to know Norm Lisherness when I was a child. My family lived in the Utopia district, not far from where Norm grew up. He also lived next door to Susie Alverson, who was one of Woolley's earliest debutantes in the early years and who became the recorder of vital statistics for the city and county. She was a dear friend of my mother's and we would often gather in Susie's yard or Norm's yard on a sunny afternoon for lemonade. A flock of kids was always present, including many of the Lisherness children, and we were always impressed by Norm's stories and his strength. I can still recall when he would take two walnuts in his hand and crack them with his fingers. The late Earl White used to delight in recalling how he sometimes rode shotgun with Norm on the patrol of the taverns in town and, occasionally, the blind-pig joints. Those were the places where alcohol was served, as well as other pleasures, but were at one time semi-recognized as social clubs by the town fathers and police. Earl laughed and noted how no one made a ruckus when Norm strode into a tavern. If the rambunctious types were still in a mood for fighting, Norm took them out into the alley and gave them a "pep talk." I was getting married just as Norm's funeral occurred, but I joined my folks and the American Legion and many others who contributed to help Norm's family. He was a unique man, although he claimed to be ordinary. More than 100 Journal stories about old Sedro and Woolley, and Sedro-Woolley after the 1898 merger.